A research has proved that one of the world's most intelligent animals - dolphins too have names. And they aren't given by humans! For the first time ever, researchers have shown how dolphins respond to individual names. The marine mammals use a unique whistle to identify each other and respond when they hear their own call. 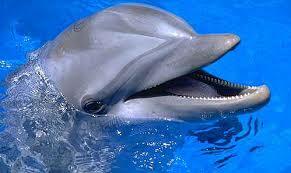 The research also said that bottleneck dolphins use signature whistles to address an individual animal, just like a name. The team of researchers followed groups of wild dolphins and recorded their unique signature whistles using a novel signature identification method. They then played back either a computer version of an animal's signature whistle, or control whistles of either unfamiliar animal from a different population or a familiar animal from the same population. Each dolphin only reacted when hearing the computer version of its own signature whistle, but not to other whistles played back to it. Dolphins are the divine gifts we must preserve. The wildspread killing of Dolphins in Japan and other countries of the world must be stopped with immediate effect. Dolphins are known to be sensitive, loving and caring. They are also helping human beings in many researches giving invaluable information. Such majestic creatures deserve a peaceful life and must be protected.